Jenelle Evans Pregnancy Update! PHOTO! 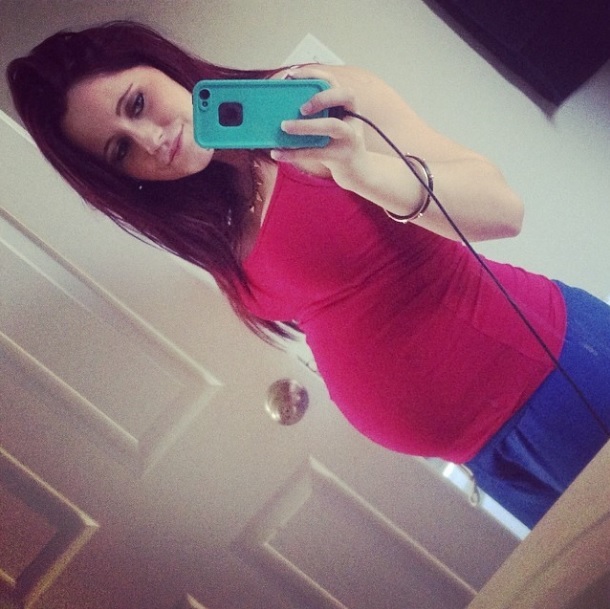 Jenelle Evans is officially 6 months pregnant with boyfriend Nathan Griffith’s child. Jenelle has been filming with MTV which she has made painfully obvious on her twitter and instagram, including scenes that involve her lawyer Dustin. They are either filming Nathan getting some legal advice due to that pesky DUI he got not long ago OR she’s talking to him about her divorce. Oh yeah, she’s still married to Courtland! Unfortunately for her she had to wait a year to get the divorce thing taken care of and that’s probably what it’s about. She’ll be able to finalize all of that this Spring. As far as the pregnancy goes Jenelle has complained of having a lot of morning sickness and trouble sleeping. She is still going to school which is good, lets hope that continues when the baby comes. She’s also continued spending more time with Jace and she’s managed to stay out of trouble for almost 3 months now. Time will tell if Jenelle has truly turned her life around. We can expect to meet her baby boy Kaiser this summer. Next Next post: Chelsea Houska: I’m Not Obsessed With Adam!